I’ve stressed the importance of eating a breakfast that’s full of fiber to keep you feeling satisfied throughout the day in a couple prior posts. Mom wasn’t lying when she said breakfast is the most important meal of the day. Anyhow, I’ve been loving lately is steel cut oats. I never thought I would because I’m not the biggest fan of oatmeal. My mom used to feed me oatmeal for breakfast a lot as a child. Then as an adult I started eating it again as I was on a “diet,” but I couldn’t stand the taste and the texture (but I’ve overcame this. more on this later) of it so I just turned my rolled oats into granola (TOTALLY WORTH IT to make it on your own by the way. Either loose granola or granola bars. Giada, Alton, and AllRecipes have great recipes to follow). I read a variety of food blogs and a couple mentioned having steel cut oats for breakfast, so when I made a trip to Whole Foods one day, I decided to buy some to try it out. I got a small portion to bring home and sample (you know the serve yourself option with nuts and grains, etc.). I ended up liking it so much that when I was at Trader Joe’s a couple weeks later I bought a container of steel cut oats. The texture isn’t “gooey” like oatmeal. It has a bit of chewy quality to it, which is quite pleasant. I’ve tried various recipes, like Kourtney Kardashian’s or Alton’s (I may sound like a groupie. I’m not. It’s just his basic recipes are good ones that I keep in my recipe box. ), but I’ve stuck with the basic cooking instructions on the box. I then add in milk and whatever “mix-ins” I feel like that morning. The thing with steel cut oats is they take FOREVER to cook. If you thought they take 3-5 minutes long like oatmeal, you’re wrong. They take 30-45 minutes long, but worth it. 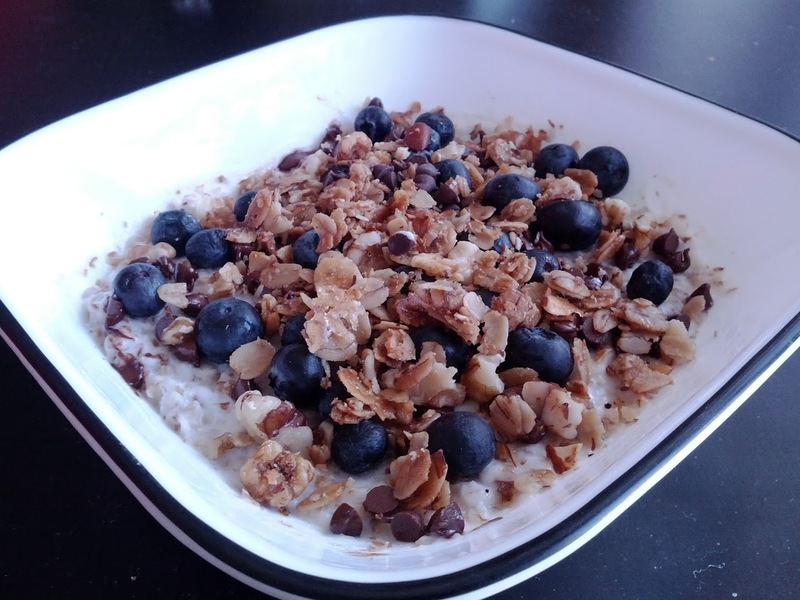 An example of one of my steel cut oatmeal breakfasts: blueberries, chocolate chips, homemade granola, milk, agave nectar, and ground flax seed (for omega3s and extra fiber boost). Items I always add to my steel cut oats or oatmeal: milk (to make it creamier), agave nectar/raw or brown sugar (for sweetness), and ground flax seed (for a boost of fiber and omega 3s). For extra crunch, I may add some toasted nuts or granola (yes I know that’s oats on top of oats, but I need different textures in my meals!). I also use these same mix-in ideas for oatmeal. Yes, I eat oatmeal now. I’ll go for the steel cut oats first before the oatmeal. But if I don’t have time, I’ll cook the rolled oats over the stove top and then add in pretty much the same mix-ins. I’ve learned that the prepackaged packs don’t give you as much fiber and flavor, which is probably why I had a distaste for it after a while. I encourage you to start with the basic recipe (prepackaged or in bulk) and then add in your mix ins (think of it as froyo if you will). It’ll make SUCH a difference and I bet its even healthier for you too! I even do this to my regular cereal (I eat various “plain” Kashi cereal). Apple crisp oatmeal: Milk, granny smith apples, cinnamon, raw sugar, flax seed, and homemade granola. What are your favorite “mix-ins” to your hot or cold cereal? I love steel cut oats. I usually put some frozen berries in my oatmeal to make it taste better.